Experience the unique safari where you will go exploring the most popular wildlife habitats in Kenya. Here, you will have the true wildlife watching activities in Maasai Mara National Reserve, Lake Nakuru National Park, and Amboseli National Park as you go on exciting game drives with your professional guide. This is a great offer for you who want to relish a wildlife adventure on budget! On this safari, you will stay at several camps in Maasai Mara National Reserve, Lake Nakuru National Park, and Amboseli National Park. You will also be accommodated at a budget hotel while you're in Nakuru. 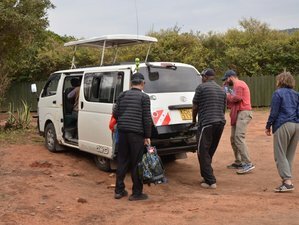 At 07:30 to 08:00, you will be picked up from your hotel and depart for the Maasai Mara National Reserve, via the viewpoint of the Great Rift Valley and Narok Town for refueling and lunch. Afterward, you will proceed to the game reserve, arriving at the camp at 14:00. You will then have a little siesta and proceed on the first introduction game viewing in Maasai Mara National Reserve. You will return back to the camp for dinner and overnight. After breakfast, you will proceed on a full day of game viewing within the reserve. The landscape here is a scenic savannah grassland on rolling hills. The reserve is the best park for games in Kenya as it has an extensive road and track network which allows for close range viewing and photography. There will be a break for your picnic lunch at the hippo pool, looking out for hippos and crocodile. The dinner and overnight will be at the camp. In the early morning, you will have a pre-breakfast game drive. After breakfast, you will depart the Mara region for Nakuru and have lunch en-route with scenic views of Mount Longonot and Lake Naivasha from afar on the main highway. The dinner and overnight will be at a budget hotel. After breakfast, you will proceed on a game drive in Lake Nakuru National Park, known for its prolific birdlife including flamingoes. The park contains a sanctuary for the conservation of the white rhinos while species like Cape buffalos and waterbucks can be seen near the shoreline. Afterward, you will drive to Amboseli National Park arriving in the late evening with game viewing en-route to the camp. The dinner and overnight will be at the camp. You will have a full day of game drives in this park which contains swamp grounds in which elephants and hippos bathe in abundance. A variety of plains game, antelopes, and birds can also be seen. You can also see Mount Kilimanjaro’s peak if weather conditions permit. Absolute Holiday Safaris will cater for your picnic lunch before returning to the camp for an overnight stay. In the early morning, you will have a game viewing activity, then return to the camp for a full breakfast. Later on, you will be transferred back to Nairobi. You can extend your stay by continuing the trip to Emali to connect the bus to Mombasa where you will enjoy the beach life. A Kenya-born adventure guide, I am a great guide who does my job with passion. I am always ready to make my services available with a clean and open heart to all clients. I have a great deal of knowledge of cultural activities, animals, birds and the Kenyan topography. My office workers are proud of me as per the services I offer to clients and the great role I play in the organization. The company chose me from my work with many tour operators and because of my good records. The people at the agency trust me with clients, as they are aware of my clients’ satisfaction. Your safari vacation will be held in Maasai Mara National Reserve, Lake Nakuru National Park, and Amboseli National Park located in Kenya. You can have an optional visit to Maasai village at an extra cost. We do daily joining group safaris, budget safaris, lodge and luxury safaris in Kenya and Northern Tanzania. Discover and explore with Absolute Holiday Safaris.